In fact we observe that firm value is concave in leverage and appears to peak when there is some equity in the capital structure. We’re forced to conclude that firm value isn’t solely a function of WACC, but instead varies in a more complicated fashion with leverage. In this post we’ll review one theory that explains this, and which can guide us in divining an “optimal” capital structure. 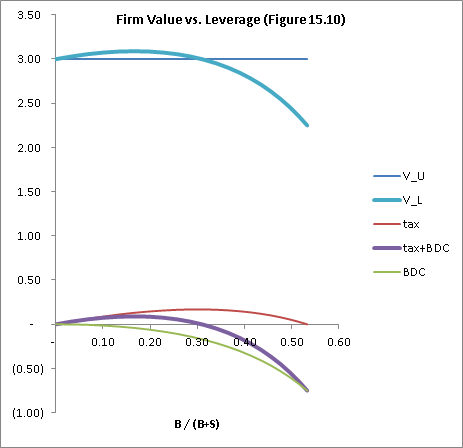 Standard WACC theory does not allow for a reduction in operating cash flows as capital structure changes: as we change leverage in a firm, the only impacts are on division of claims between debt- and shareholders, and on the interest expense tax shield. However we find that firm value peaks at less than 100% debt. The only way to achieve this result is to violate one of the Modigliani-Miller assumptions, and model asset flows as depending on leverage. We will assign two types of costs to financial distress. Bankruptcy costs cover legal expenses of Chapter 11 filings. They usually constitute less than 1% of the pre-distress value of a firm, and we ignore them for the balance of this post. Business disruption costs quantify the reduction in operating asset cash flows as leverage increases. These costs can rise to over 30% of firm value (Korteweg, The costs of financial distress across industries, 2007). A common case study is Chrysler during its 1979 distress, when it lost an estimated 5.1% of sales due to perceived distress. These costs reflect opinions by customers, vendors, and management that the firm may not survive. These costs begin to occur well before default or bankruptcy, and in fact can help drive an otherwise solvent firm into bankruptcy. As we add leverage, can we increase asset risk? Again, no, because throughout the WACC framework what we call asset risk (which is identical to WACC under a 0% tax rate) is the unlevered asset risk. Asset risk in the WACC framework, by definition, is independent of capital structure. In summary: the standard WACC framework disallows costs due to financial distress, so these costs must be accounted for in a different way. Models of financial distress costs are limited; most published work tries merely to document empirical cases. Since these costs are driven primarily by psychological factors, they are notoriously difficult to predict. When firm value falls to the value of debt, business disruption costs (expressed as a percentage of unlevered firm value) result. As referenced above, these costs can be 30% or more. Additionally, at this point any interest expense tax shield is no longer enjoyed. 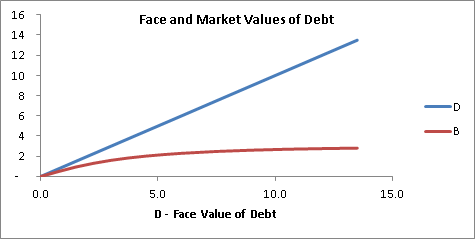 Regardless of leverage, the firm’s debt (face value D) always pays the same coupon (risk-free rate). 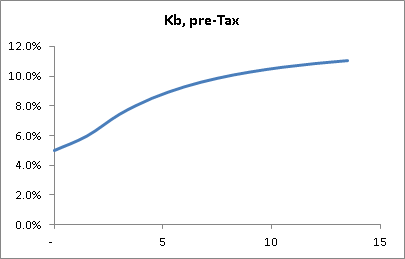 We express debt risk as a reduction in market value of the debt (B), so that B < D, which produces a cost of debt that rises with leverage. p (between 0 and 1) combines the likelihood and present value impacts of future business disruption. It is a function of leverage. The first two of the four terms give the levered levered firm the same value that the Modigliani-Miller framework provides. The third term reduces the value of the tax shield for distress; the fourth term reduces the value of the operating assets for distress. In this example, V_L is maximized at 17% leverage (defined as the ratio of market value of debt to total capitalization). Input parameters: The blue cells in the spreadsheet indicate input assumptions. Several of these (face value of debt, tax rate, risk-free rate, levered firm value) can be observed and entered directly. Of the remaining model parameters (V_U, rho, sigma, alpha, debt maturity, default boundary), calculate what you can from analysis. For example, rho (required return) could be derived from the (unlevered) cost of assets for other firms in the same industry. V_U could be calculated using a DCF analysis of the asset’s cash flows. Since the model’s output (levered firm value) is directly observable (as the firm’s enterprise value), it’s possible to construct a system of equations with your remaining unknowns, and solve the system simultaneously. Alternately, you could sensitize to values for the unknown inputs; for example, execute the model for varying values of alpha.